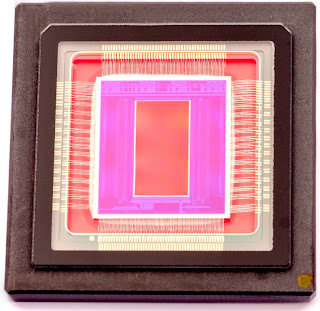 "The imaging team set out to solve this problem by applying our knowledge of chip design, signal processing & managed dataflow learned from our 100+ years of combined experience designing sensors and camera systems." "Binary Pixel technology builds upon the visionary works of imaging and signal processing experts including: The Gigavision Camera by Professor Martin Vetterli at École Polytechnique Fédérale de Lausanne (EPFL) and Professor Edoardo Charbon at Delft University of Technology & EPFL; The Digital Film Sensor by Dr. Eric Fossum, pioneer in the modern CMOS active pixel image sensor." cameras that exceeds most DSLRs"
There are more photos at Japanese-language web site Imager Mania (nice site, BTW, I've added it to the Imaging Links in the left column), and apparently, a talk with NHK representative. E.R. 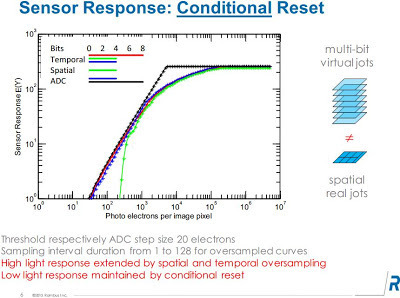 Fossum, Quanta Image Sensor (QIS): Early Research Progress (invited) in Proc. 2013 OSA Topical Meeting on Imaging Systems, Arlington, VA USA June 24-27, 2013. PR Newswire: Sony unveils Rx-100 II compact camera featuring 1-inch (13.2 x 8.8 mm) BSI CMOS sensor. The sensor's resolution is 20.2MP and the pixel size is 2.4um. Sony says that it is approximately 40% more sensitive to light compared to the same size FSI sensor in last year's RX100 camera. "In some situations, however, only a portion of the image pixels a pixel array may used to capture image data at any given time. For example, in some situations a sub-array of image pixels may be used to capture image data when it is desired to capture image frames having a reduced size at an increased frame rate. In a conventional image sensor, power that could otherwise be used to operate other portions of the imaging system or that could otherwise be stored and used for later imaging operations can therefore be used to unnecessarily power column readout circuits that are coupled to unused image pixels. It can be particularly useful to conserve this type of power in portable imaging systems that use batteries to provide power to the device or in power-saving modes in larger electronic devices with imaging systems." 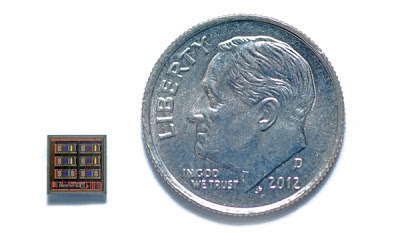 Business Wire: OmniVision announces the OV8865, a low-power, high-performance 1/3.2-inch 8MP sensor targeting mobile devices, including advanced smartphones and tablets. Featuring an improved 1.4um OmniBSI-2 pixel, the OV8865 is said to deliver better pixel performance in a smaller package and uses less power when compared to the previous-generation OV8835. "Reports are predicting that more than 1.8 billion smartphones and 250 million tablets will be produced annually by 2015, with the majority of this growth expected to come from developing markets like China and India. We are bringing to market the OV8865 at a time when manufacturers in these booming markets are looking for a cost-competitive camera solution for their slim and feature-rich devices with extended battery life," said Harish Iyer, product marketing manager at OmniVision. 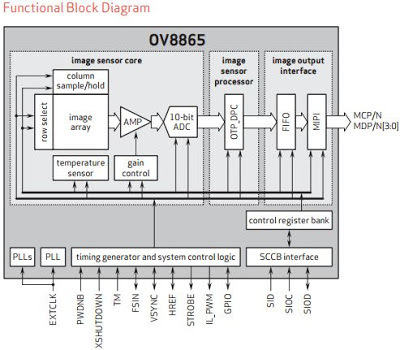 "The 8-megapixel OV8865 has been re-engineered from top to bottom. With an enhanced 1.4-micron OmniBSI-2 pixel, the OV8865 has improved camera performance and image quality when compared to our last generation 8-megapixel sensor, and offers smaller package-size and lower power consumption." 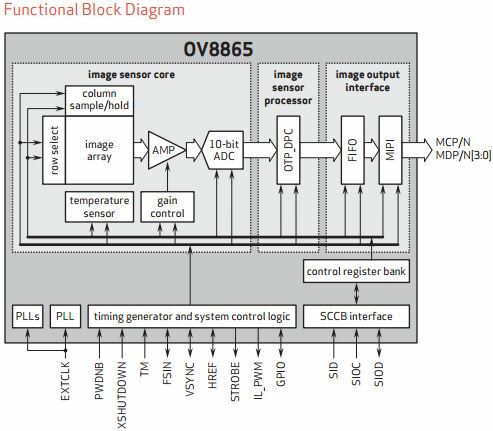 The OV8865 provides a number of performance improvements over the previous generation OV8835 CameraChip sensor: dark current has been reduced by 50% and DR is improved by 5% (should be 15% or 1.5dB: was 68.7dB, now 70.23dB). Additionally, the OV8865 consumes less power when compared to the OV8835, achieving the sub-200 mW benchmark currently favored by many high-end mobile device manufacturers. Both new and old sensors have 30fps speed at full resolution. The sensor also delivers 1080p30 or 720p60 video with EIS. The OV8865's 2 x 2 binning functionality with post-binning resampling filter minimizes spatial artifacts. 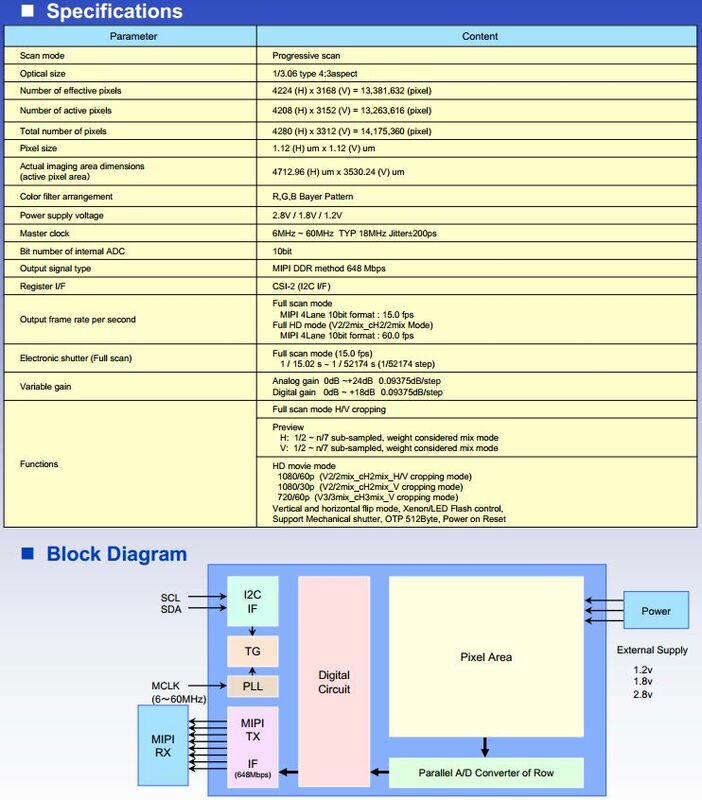 The OV8865 comes in a smaller footprint when compared to the OV8835, fitting into 8.5 x 8.5 x 5 mm module. 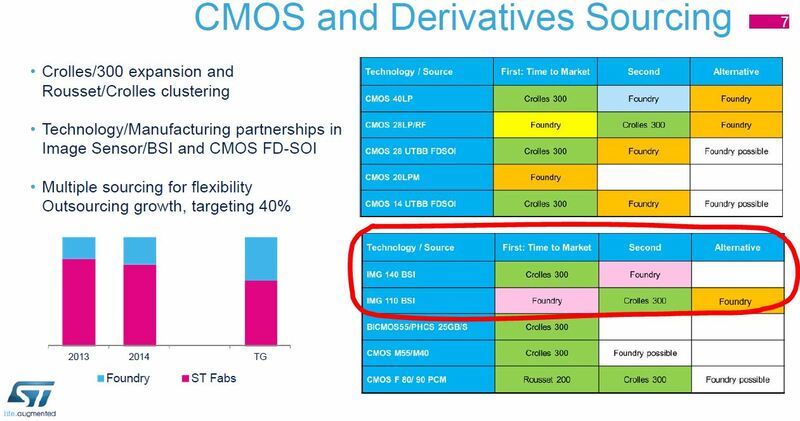 It is currently available for sampling and is expected to enter volume production in the Q4 2013. If the manuscript is submitted until March 2014, the publication fee is free. Reviewers will be assigned in world wide. Authors of IISW 2013 papers are welcome to submit their original papers on the significant part of their work presented at IISW 2013 to the Special Issues of MTA. Video contents is encouraged in order to accelerate the manuscript understanding by readers. Update: Video content should be included as URL link. Albert Theuwissen concludes his excellent series of reports from IISW 2013. The fourth day was the day of global shutters and oversampling in various domains. Pelican Imaging announces at its LinkedIn Company Page that it has received a Telly Award for "smart camera" video. The Telly Awards was founded in 1979 and is honoring outstanding commercials (including on-line commercials), programs, video and film productions. The winning video appears to have been produced by The Distillery creative agency, in case anybody wants to promote his/her image sensors too. Update: Toshiba has published this video on Youtube, one can watch it in 1080p quality. 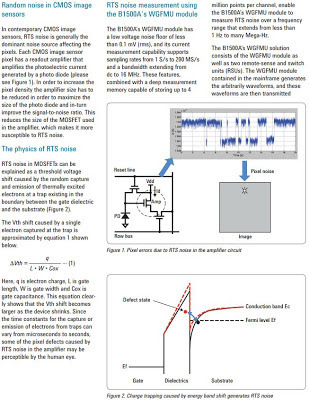 Fujitsu Scientific and Technical Journal, Vol 49, No. 1 is entirely devoted to the company's image processing LSIs, including its Milbeaut ISPs for DSCs and mobile phones. 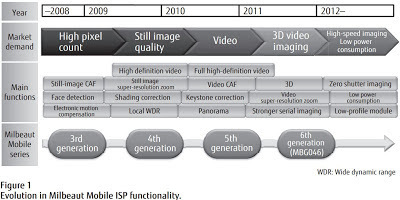 The scope of the articles spans from the ISPs descriptions to H.264 compressor features, to packaging trends, to system verification and more. NASA assembled a Giga-pixel panorama from few hundreds of pixels pictures sent by Curiosity rover. Impressive achievement! Albert Theuwissen continues his review of IISW 2013 news. Day 3 part covers CCD and CMOS presentations and invited talk by Mike Tompsett. Business Wire: TowerJazz-US announces that it will be the wafer manufacturer for IR sensing and camera devices. In addition to traditional IR defense and space applications, TowerJazz will facilitate expansion into other consumer markets such as gaming, personal security, and application driven platforms, market segments which are already well served by the company. "Our leading edge CMOS for custom imaging products and our expertise in bringing specialty processing and MEMS to volume manufacturing fits extremely well with the proven capabilities of our customer," said David Howard, Executive Director and Fellow, TowerJazz. -The IISS Walter Kosonocky Award is presented bi-annually for THE BEST PAPER presented in any venue during the prior two years representing significant advancement in solid-state image sensors. The award commemorates the many important contributions made by the late Dr. Walter Kosonocky to the field of solid-state image sensors. 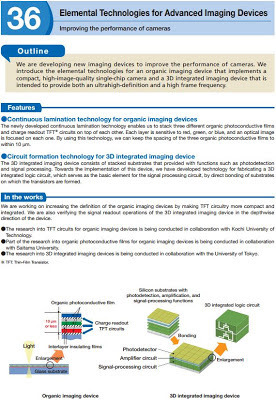 The 2013 IISS Walter Kosonocky Award was presented for the paper “A 33-Megapixel 120-Frames-Per-Second 2.5-Watt CMOS Image Sensor With Column-Parallel Two-Stage Cyclic Analog-to-Digital Converters,” by Kazuya Kitamura, Toshihisa Watabe, Takehide Sawamoto, Tomohiko Kosugi, Tomoyuki Akahori,Tetsuya Iida, Keigo Isobe, Takashi Watanabe, Hiroshi Shimamoto, Hiroshi Ohtake, Satoshi Aoyama, Shoji Kawahito, and Norifumi Egami. The author team is from NHK, Brookman Technology and Shizuoka University. -The IISS Exceptional Service Award is presented for exceptional service to the image sensor specialist community. The 2013 award was made to Albert J.P. Theuwissen for exceptional contributions to the education of image sensor specialists through his books, university teaching, organization of various educational activities in conjunction with IEEE and IISS meetings, and continuing professional education with Harvest Imaging. -The IISS Exceptional Lifetime Achievement Award is made to a member of the image sensor community who has made substantial sustained and exceptional contributions to the field of solid-state image sensors over the course of their career. The 2013 Award was presented to Gene P. Weckler for significant contributions to the advancement of solid-state image sensors. 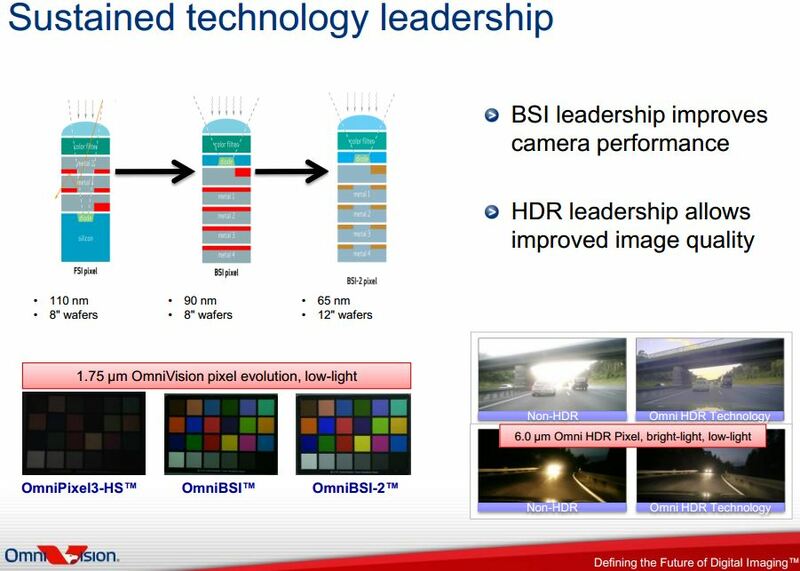 -Among the many excellent presentations made at this year’s IISW, the IISW was honored to have Dr. Michael Tompsett, who invented and developed the CCD image sensor (US Patent No. 4,085,456), deliver a keynote speech. 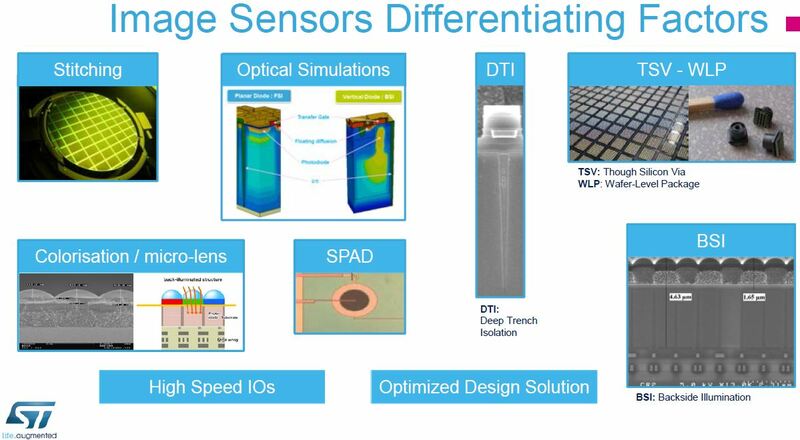 Dr. Tompsett touched on many aspects of the invention and subsequent development of the CCD image sensor as well as his other activities in solid-state electronics. Dr. Tompsett received a standing ovation from the audience at the conclusion of his talk. -The IISS announced the 2015 IISW will be held in Europe and Co-Chaired by Johannes Solhusvik and Albert Theuwissen, with Pierre Magnan serving as Technical Program Chair. The exact location is TBD. -The IISS also announced changes in its organization. As part of a planned leadership rotation, Nobukazu Teranishi will assume primary responsibility of the IISS as President for the coming six years commencing at the conclusion of the 2013 IISW, taking the reins from Eric Fossum, who has served as President for the first six years of the IISS. The IISS has added Boyd Fowler to the Board of Directors, joining Teranishi and Fossum, as well as Solhusvik, Theuwissen and Junichi Nakamura, yielding two Directors from each of the three continental regions served by the IISS and the IISW. -The International Image Sensor Society (IISS), a California Non-Profit, Public Benefit Corporation for scientific education, plans to have no membership requirements or dues for the coming year, and will continue to offer free and unlimited access to its on-line library of Workshop papers dating to 1986 and before. The papers from the 2013 IISW will be posted in mid-September 2013. The workshop site has 2 group photos taken with Nokia 808 Pureview camera phone and Canon EOS5D cropped to 13MP - one can compare a quality. 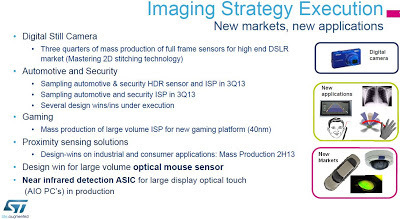 Imec presents a CMOS sensor capturing 12b 4000 x 2000 pixel progressive images at 60fps. 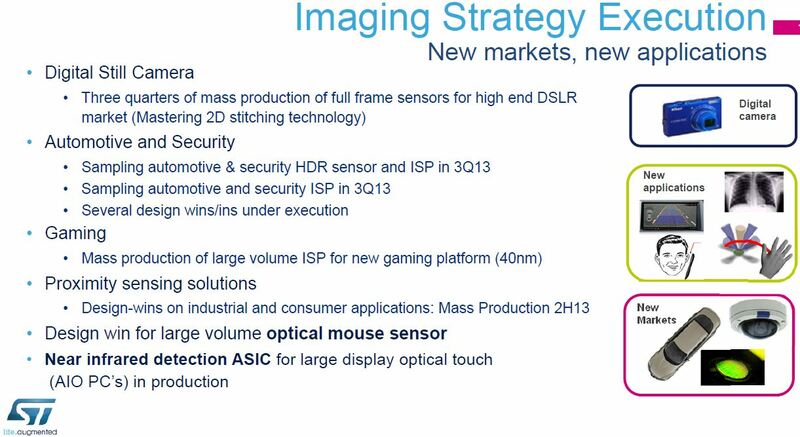 Based on a stagger-laced dual exposure, the image sensor developed with Panasonic, was processed using imec’s 130nm CMOS process on 200mm silicon wafers to deliver high-speed and high-quality imaging, at reduced output bit rate. The sensor is based on 4T shared pixel with a pitch of 2.5um and a conversion gain of 70 μV/e-, which allows for both a classical rolling shutter or stagger-laced scanning mode. 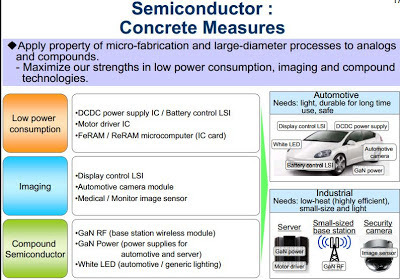 The sensor has 12-bit column-based delta-sigma ADCs. The stagger-laced scanning method improves imaging sensitivity and realizes a 50% reduction in output data rate by alternating the readout of two sets of horizontal pixel pairs arranged in two complementary checkerboard patterns. The overall power consumption of the imager is less than 2W. “This is an important milestone for imec to demonstrate our capability to co-design, prototype and manufacture high performance CMOS image sensors in our 200 mm CMOS fab,” commented Rudi Cartuyvels, SVP of Smart Systems & Energy Technologies at imec. "Victor Bahl, research manager of the mobility networking group at Microsoft Research... said at the MIT Technology Review Mobile Summit in San Francisco on Tuesday that while much work has been done to reduce the size and improve the resolution of image sensors, there hasn’t been much attention paid to their power circuitry." Microsoft proposes to reduce the sensor power by powering down the sensor between the active capture slots, described in their paper at Mobisys conference to be held later this month in Taiwan. The day 2 report by Albert Theuwissen covers SPAD imagers and poster sessions at International Image Sensor Workshop at Snowbird, UT. 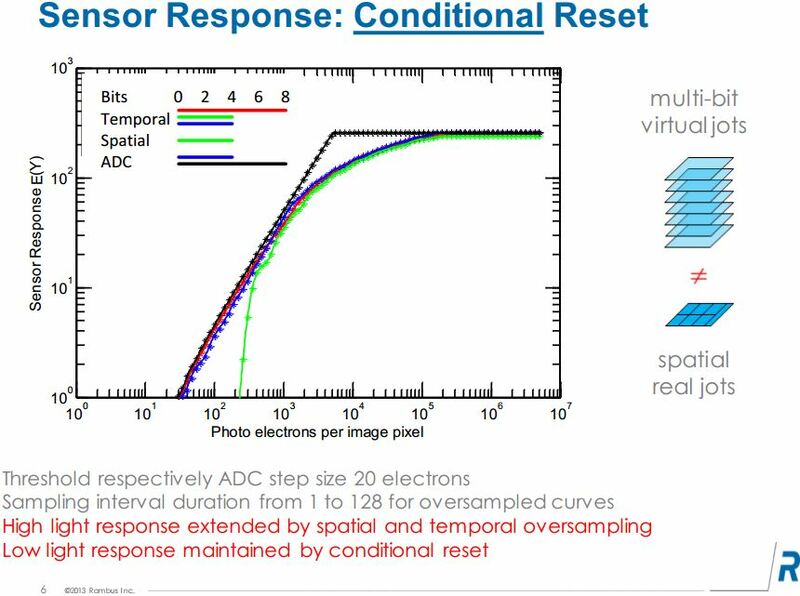 Taiwan National Chiao Tung University published a nice CMOS image sensor course materials covering pretty much all important things in just 75 slides, written by Chia-Ming Tsai. There is also 58-slide long CCD course on the same page. Update: As written in comments, most of the material in the CMOS and CCD slides is not original and, actually, copied from Albert Theuwissen's and Stanford University courses. Albert Theuwissen published a review of the first day presentations at International Image Sensor Workshop being held these days in Snowbird, UT. 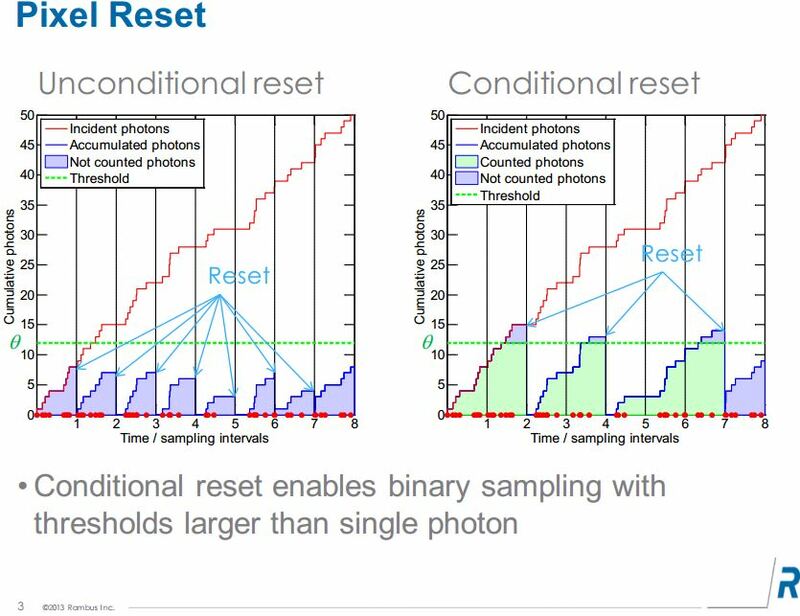 As there are too many presentations to write, Albert just mentioned a few spanning from reverse engineering revelations to the sensor noise analysis. Scallop Imaging, a division of Tenebraex, published Vimeo video demonstrating its Gemini 2-channel color filter performance in low light. The video is made using "a leading 1.2MP monochrome sensor with 3.75 µm pixel" equipped with the Gemini color filter array. It's compared to the color version of the same image sensor. One can also see a few snapshots and discussion i comments to my earlier post on this 2-color filter technology. Business Wire: Thomas Vogelsang, Rambus, is to present present results from an binary pixel sensor test-chip that demonstrates DR extension by a factor of 14 compared to a conventional sensor in the same technology. 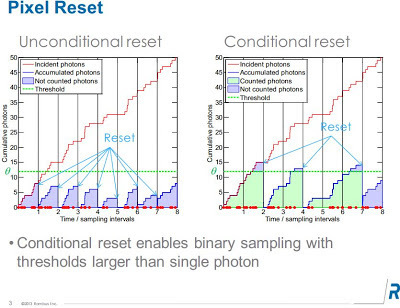 During this presentation at IISW 2013 being held these days in Snowbird, UT, Thomas Vogelsang will discuss the system design of the Rambus Binary Pixel technology and how the HDR image sensor oversamples the incident light by using the ADC output at each sampling and resetting the pixel only if a threshold has been exceeded. 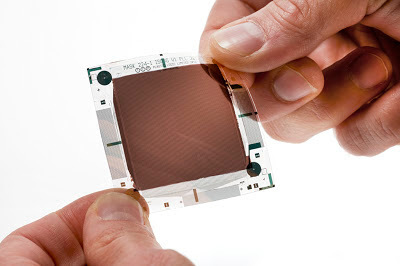 Imec News, Solid State Technology: At this week’s IISW (Snowbird, US, June 12-16 2013), imec and Holst Centre present a large-area fully-organic photodetector array fabricated on a flexible substrate. The imager is sensitive in the wavelength range between 500 and 600 nm, making it compatible with typical scintillators and therefore suitable for x-ray imaging applications. Because of their very high absorption coefficient, organic semiconductors allow extremely thin active layers (10 to 50 nm). Also, given their low processing temperature, they can be processed on foils. As a result, organic imagers can be more robust and light-weight compared to their traditional counterparts and may be used for conformal coating of randomly shaped substrates. Moreover, the wide variety of organic molecules available ensures that the properties of the active layer can be tuned to applications requiring specific wavelength ranges. 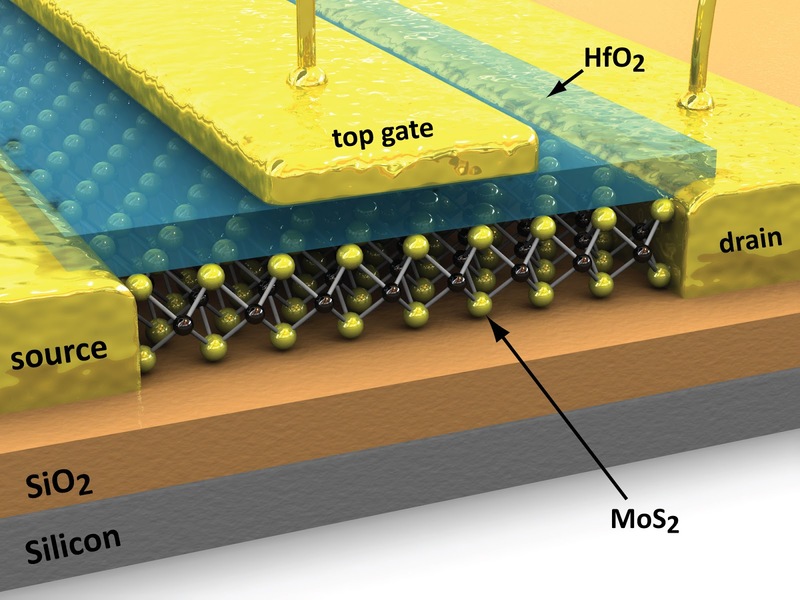 ScienceDaily, Phys.org: In 2011, an EPFL team led by Andras Kis announced molybdenite (MoS2) and its potential in various technological applications. Now they publish a paper in Nature Nanotechnology presenting a molybdenite sensor prototype. Optics.org: SiOnyx sensor successfully captured images when the system was operated by the US Army, in a test scene at the Army’s premier agency for night vision technology, a company official said. "This validated the system’s ability to image at 60 frames per second at 1 millilux," replicating moonless night, said Martin Pralle, VP of government programs at SiOnyx. "That’s the point at which this becomes useful in a lot of military scenarios," he added. "We did it in their labs, on their equipment. They controlled the amount of light. We now have independently validated the camera in the Army’s premier test site." The SiOnyx sensor is said to offer a ten-fold increase in sensitivity at 1064 nm, the wavelength of choice for many laser targeting applications. 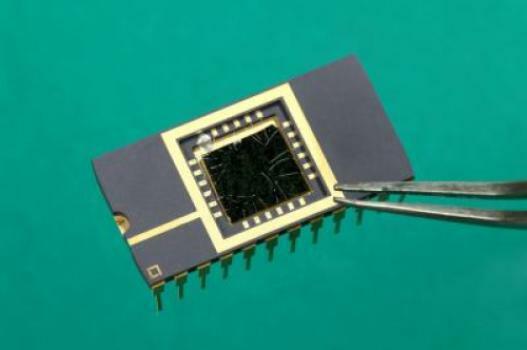 In addition to the military products, SiOnyx plans to announce a number of consumer applications requiring the enhanced IR of black silicon, which could see the technology used in computational imaging or biometrics. The SiOnyx imagers are fabricated by TSMC. equivalent to what the US Army saw in their recent laboratory tests. Business Wire: CMOSIS and TowerJazz announces the ramp to volume production for CMOSIS’ 12-megapixel CMV12000. The off-the-shelf CMV12000 is manufactured in TowerJazz’s Fab-2 in Migdal Haemek, Israel using its 0.18µm specialty CIS process (TS18IS) and is based on CMOSIS’ collaboration and co-development with TowerJazz’s R&D group. The CMV 12000 product features 5.5 x 5.5 µm pixel 4096 x 3072 array covering 4k resolution in an APS-C optical format. It offers high sensitivity and low noise, global shutter and a frame rate of 150 fps providing best in-class performance serving various markets such as industrial inspection, broadcasting, motion analysis and others. 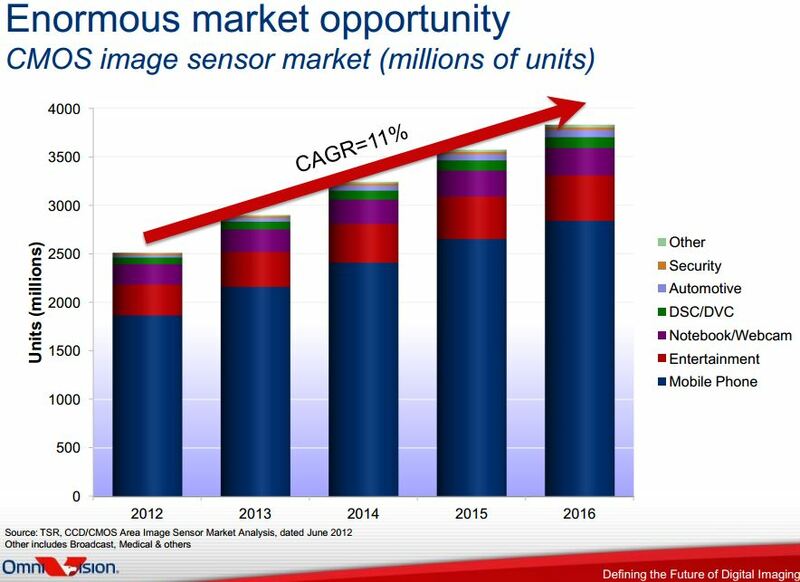 According to a 2012 Yole Développement CMOS image sensors report: 530,000 machine vision cameras were sold in 2011 and sales of machine vision cameras are expected to grow to 644,000 units in 2015 at a 5% CAGR. The report also noted that while today CCD still represents the large majority of the machine vision market, CMOS cameras are expected to represent half of the sales in 2015 and to take over about 80% of the machine vision market in 2020. Today, CMOS-based cameras represent only 20% of the global market in units, but 80% of the R&D of camera manufacturers’ investments. 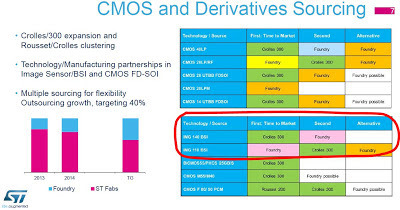 CMOSIS continues to expand its relationship with TowerJazz to collaborate on its next generation of CMOS image sensors. TowerJazz’s process features low dark current, low noise and high dynamic range and its skilled support the customization of pixels per customer requirements and project needs. "We have enjoyed a very fruitful relationship with TowerJazz for several years. TowerJazz has an expert team that can customize the CIS process to our needs and create, together with us, new pixels that outperform our competitors. Our ability to offer innovative imaging products with highly reliable performance is based on our collaboration with TowerJazz and their mature process technology, extensive R&D investment and excellent customer support. By combining our companies’ expertise, we are able to offer a rich solution for various digital imaging applications," said Lou Hermans, COO, CMOSIS. 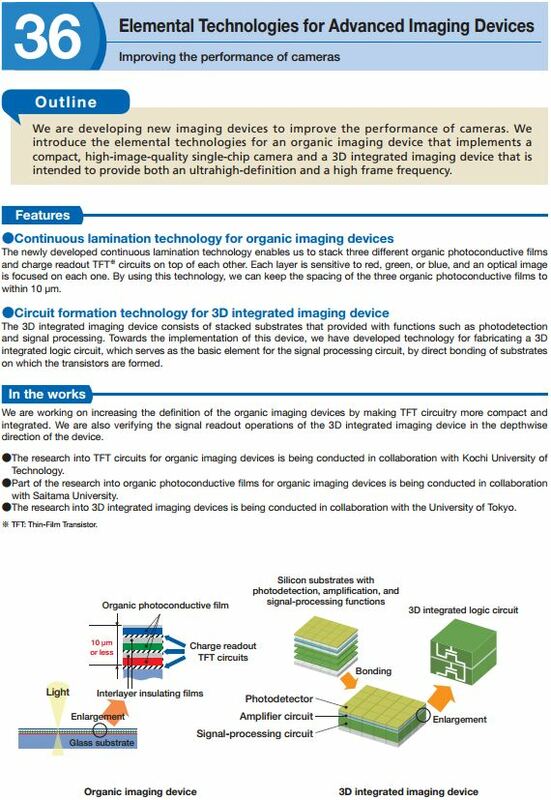 Panasonic and Fujifilm present two papers on their latest developments on organic pixel sensors: one at VLSI Symposium and a second one at IISW this month. The sensor combines Fujifilm's organic photoelectric conversion layer technology with Panasonic's semiconductor technology, including a newly-developed noise-cancelling circuit. 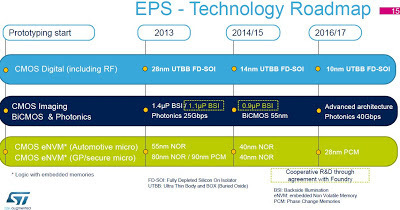 The new organic CMOS image sensor is said to offer the industry's highest dynamic range of 88dB, advanced sensitivity 1.2 times higher than conventional sensors (by Panasonic) and broader range of incident angle (up to 60deg) to enable the production of more sensitive and compact lenses with better image quality. 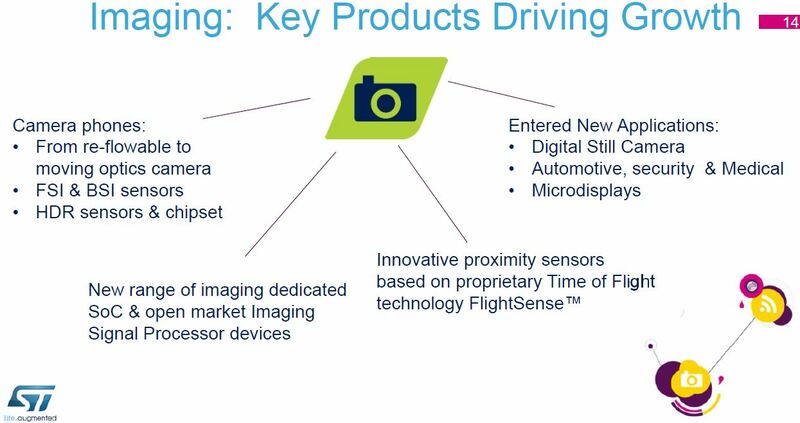 The two companies will promote the application of this organic CMOS image sensor technology to a wide range of products including security cameras, in-vehicle cameras, mobile device and digital cameras. The pixel size ranges from 0.9um to 3um. ISORG's distributor in Japan, Techno Alpha, receives JPCA Show Award (Tokyo, Japan) for "a disruptive technology for industrial and consumer electronics applications". Plastic Logic and ISORG join forces to commercialize flexible image sensors. The collaboration is based on the deposition of organic printed photodetectors (OPD) by ISORG, onto a plastic organic thin-film transistor (OTFT) backplane, developed by Plastic Logic, to create a flexible sensor with a 4x4 cm active area, 375um pitch (175um pixel size with 200um spacing) and 94 x 95 = 8 930 pixel resolution. 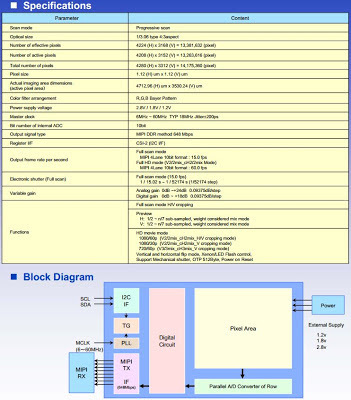 The backplane design, production process and materials were optimized for the application by Plastic Logic to meet ISORG's requirements. Combined with ISORG's unique organic photodetector technology, it opens up the possibilities for a range of new applications, based around digital image sensing, including smart packaging and sensors for medical equipmen tand biomedical diagnostics, security and mobile commerce (user identification by fingerprint scanning), environmental, industrial, scanning surfaces and 3D interactive user interfaces forconsumer electronics (printers, smartphones, tablets, etc.). 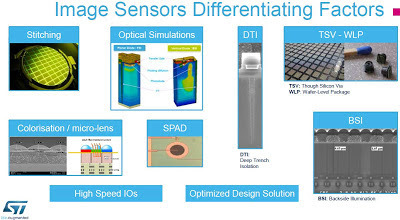 ISORG's CEO, Jean-Yves Gomez stated: "We are extremely pleased to showcase our disruptive photodiode technology in a concrete application for imaging sensing. 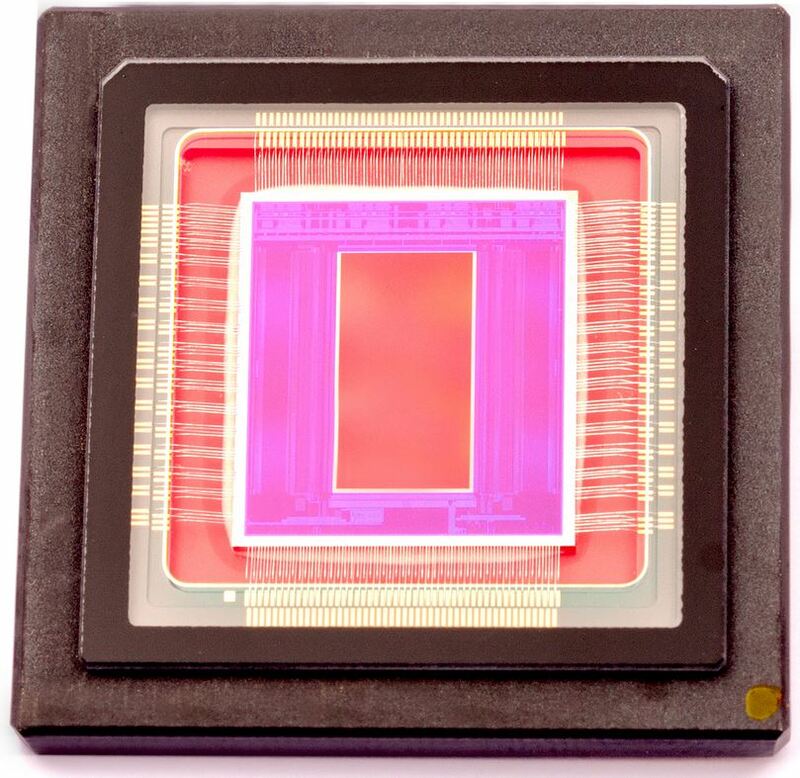 The ability to create conformal and large area image sensors, which are also thinner, lighter and more robust and portable than current equipment is of increasing importance, especially in the medical, industrial and security control sectors." Indro Mukerjee, CEO Plastic Logic said: "I am delighted that Plastic Logic can now demonstrate the far-reaching potential of the underlying technology. 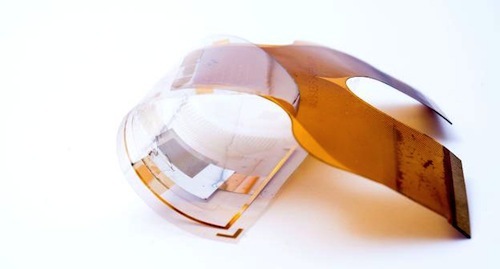 Our ability to create flexible, transmissive backplanes has led us not only to co-develop a flexible image sensor,but is also key to flexible OLED displays as well as unbreakable LCDs." One would expect the excessive energy to burn color filter first, while the underneath layers be able to withstand quite a significant heating. But it looks like the a whole column and/or row stops working, pointing to the electrical nature of the damage. The laser is green and should not cause the oxide charge accumulation in MOSFETs and STI. So, what can be the mechanism of such a damage? 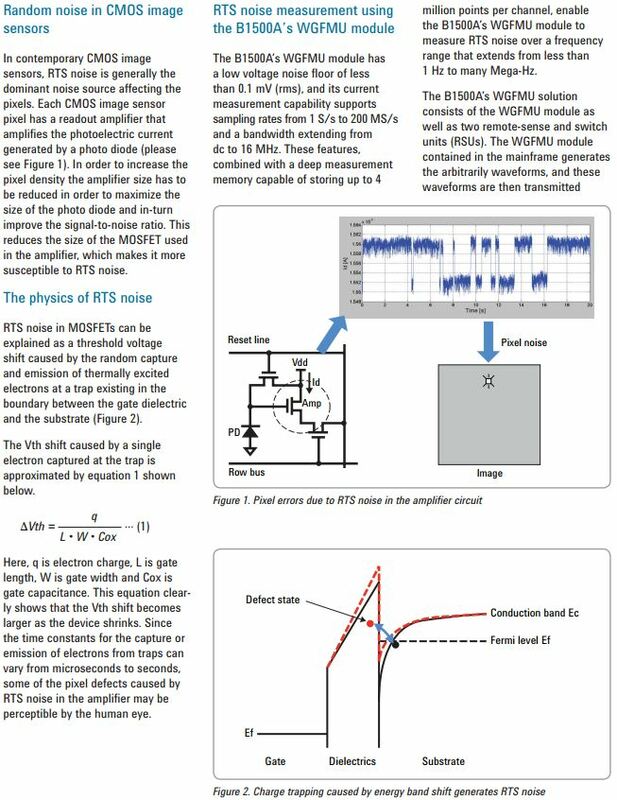 My first guess was that a large photocurrent on the transistor diffusions in the array exceeds elecromigration limits blows some metal or via. Most CIS processes offer about 0.5mA per um of metal width for the array metals. Then, assuming the metal width in RED and Canon large sensors is 0.2um, the maximum allowed current should of order of 100uA. To get to this current, the photon flux should be about 2.0e15 ph/s per pixel. Seems way too much for these concert lasers. And even if we managed to reach the electromigration limit of 100uA, the metal is supposed to last a long time at that current, such as 10,000 hours or more, assuming the sensor is colder than 70-80C. So, my next guess was that these large sensors get much hotter in video mode. If my memory serves me, the electromigration increases 3 times per 15C of temperature rise. Still, this does not sound enough to fit to the electromigration theory. So, the next guess was that the laser heats the pixel locally, to 200-250C or so and then the electromigration limit gets exceeded. Currently, this seems to be my best guess. If true, the workaround should be to put the current limiters at each column and row, and also to the pixel VDD lines. Anyone has a better explanation for the damage? Update: Yet another Canon video of laser show published at Youtube on June 21, 2013, showing a similar column and row damage. GlobeNewswire, SeekingAlpha: Ambarella, a developer of HD video compression and image processing chips, announces results for its fiscal Q1 ended April 30, 2013. Revenue for the quarter was $33.9M, up 30.9% from $25.9M in the same period a year ago. GAAP gross margin the quarter was 63.9%, compared with 71.0% a year ago. GAAP net income for the first quarter of fiscal 2014 was $4.7M, compared with GAAP net income of $2.6M for the same period a year ago. Cash at the end of the last quarter was $104.3M. "We are very pleased with our progress in the first fiscal quarter, with total revenue up 31% over the first quarter of last year and with the successful addition of new customers in key markets," said Fermi Wang, President and CEO of Ambarella. "During the quarter, we made excellent progress in the IP security camera market with new design wins at both professional and consumer IP-camera customers. 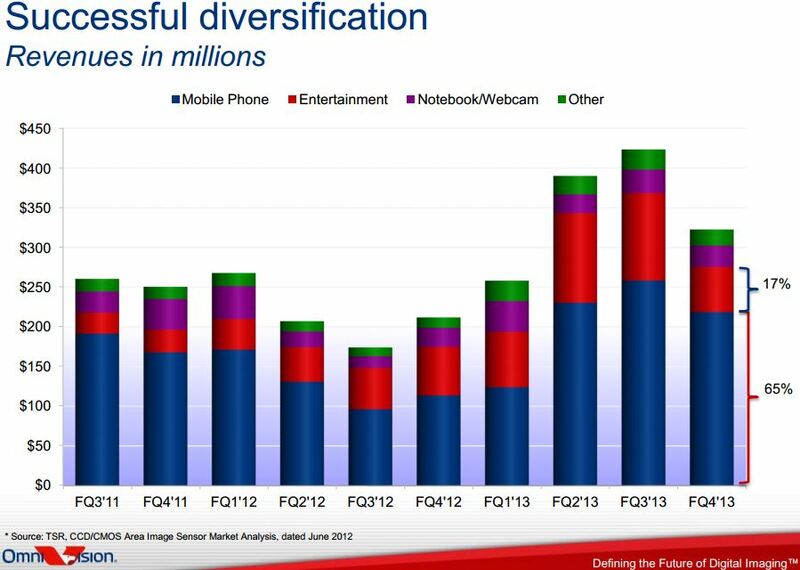 We also saw especially strong revenue growth in the wearable sports camera category, led by market leader GoPro. 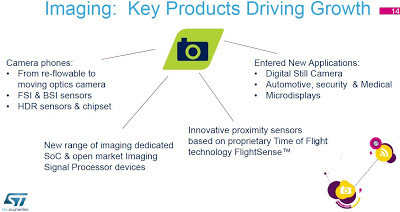 In the automotive camera after-market, we continued to grow revenue while successfully expanding our customer base." Business Wire: Intel Capital announces a $100M investment fund to accelerate Perceptual Computing (PERC) technologies across the spectrum of Intel architecture platforms. "Devices with human-like senses – the ability to see, hear and feel much like people do – has long been a subject of science fiction but is now within reach given recent innovations in compute power and camera technology," said Arvind Sodhani, president of Intel Capital and Intel executive vice president. "This new fund will invest in start-ups and companies enabling these experiences, helping them with the business development support, global business network and technology expertise needed to scale for worldwide use." The Intel Capital Experiences and Perceptual Computing Fund will invest over the next 2-3 years. Areas of software and application investment will include broader touch applications, imaging, gesture, voice and emotion sensing and biometrics, among others. An interactive gesture camera from Creative, the Senz3D to be available to consumers in the third quarter of this year. 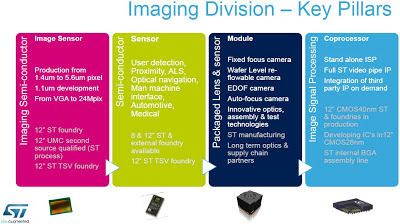 Leading the development and enabling the integration of 3-D depth camera technology by working with multiple OEM partners to build the technology into various Intel-based devices with targeted availability for second half of 2014. Facial log-in software from Sensible Vision will ship preloaded from multiple OEMs. 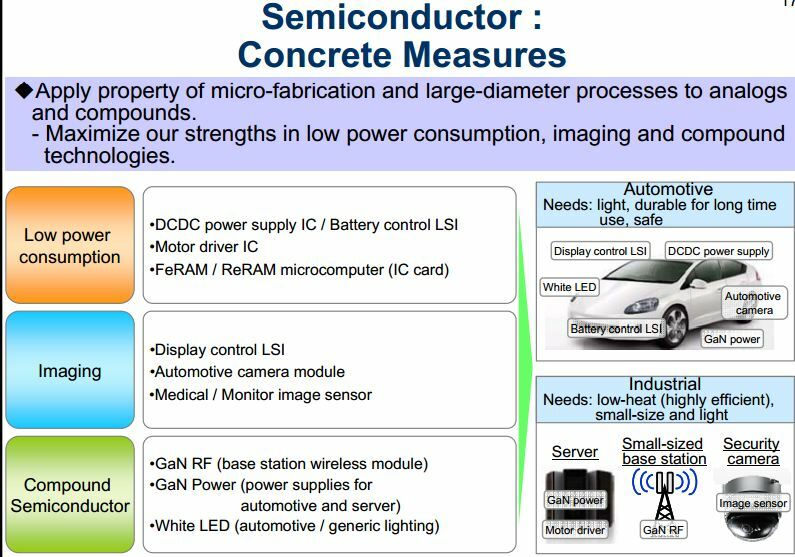 Sony Japan received Prime Minister Invention Award for "development of CMOS image sensor technology for the next generation by the invention of back-illuminated CMOS image sensor" (Microsoft translation, Google translation). Prime Minister Invention Award is a prize for the invention that have greatly contributed to the science and technology and the development of the industrial economy. 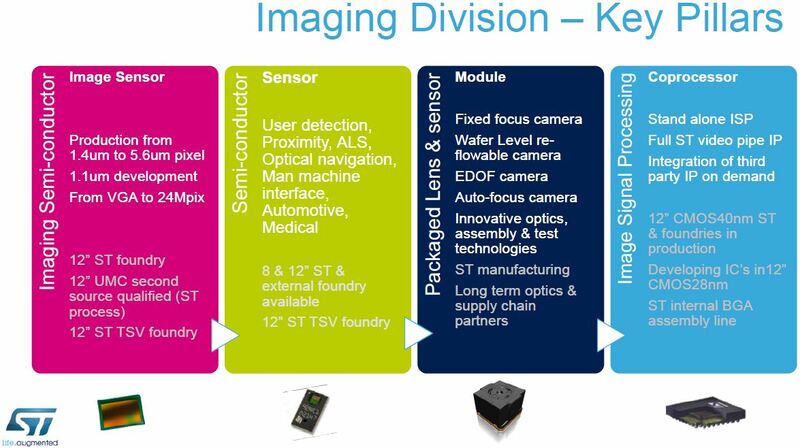 STM has held an 2013 Investors & Analysts Day on May 16, presenting few updates on its image sensor business.